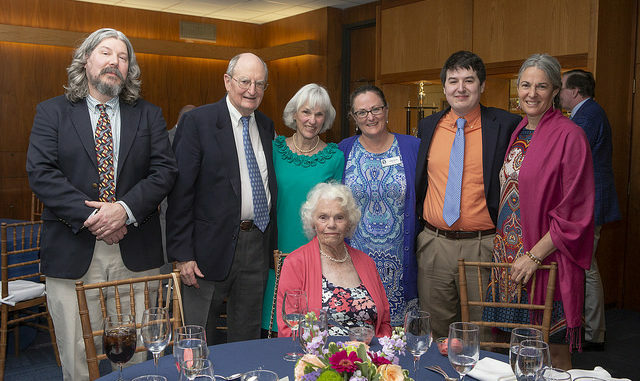 The Roffes at the June 2018 retirement dinner of Mr. Briggs, when he retired from the Canterbury Board of Trustees. Left to right: Rob Roffe, Jim Briggs ‘56 (Mrs. Roffe’s father), Mary Lou Briggs (Mrs. Roffe’s mother), Cammy Roffe, Cam Roffe, Lee Couch (Mrs. Roffe’s sister). Seated, Dorothy Venter (Mrs. Roffe’s grandmother). Imagine working as a teacher in your old high school. Now imagine being coworkers with your parents. The second Mr. Roffe, the newest member of the Math department, is the third generation of Roffe teachers at Canterbury. His maternal grandfather, Jim Briggs, was a Canterbury alum, teacher and member of the Board of Trustees. Meanwhile, his mother and father, Mr. and Mrs. Roffe, have been teachers at Canterbury since 1996. And, both he and his sister attended Canterbury. Mr. Roffe received his bachelor’s degree in economics from the University of Connecticut in 2016. “I basically grew up at Canterbury,” he said. He also serves as a tutor in the Donovan Center for Learning, meeting with students one-on-one for math and organizational instruction. He also assists his father with the after-school Media Arts elective. Despite growing up in a family full of teachers, Mr. Roffe never thought he would be a teacher. That changed when he started to work as a part-time teacher in the Donovan center after he graduated college. Even though he loves keeping the family tradition of teaching at Canterbury alive, teaching can be very challenging. “I was hired close to the start of school, so it was a big challenge getting into the mindset of teaching,” he said. But he finds being able to work with such a great community and wonderful classes rewarding. Being co-workers with his parents is certainly a unique experience. Mr. Rob Roffe, Cam’s father and Computer Science Chair, isn’t adverse to teasing his son when the occasion presents itself. “I think the most embarrassing incident Cam had as a student here was when he took Honors Biology with his mother and had to listen to her teach his class about the human reproductive system,” he said. What kind of advice did he give his son? Welcome to the second Mr. Roffe.